Check out StällDesk on Kickstarter. This project is for a standing desk made from high-quality—and very attractive—plywood called ApplePly. The retail price for this desk will be $199, but there are currently early bird funding options left at $129 that will get you one. The thing that first grabbed me about this desk is that it’s gorgeous. The shape is sleek and elegant, and the finish is beautiful. It’s adjustable, and you assemble/disassemble it without using screws. It’s also very strong, courtesy of ApplePly. Check out the project’s page for images of people standing on it. Also check out the closeup images of the StällDesk itself to see the fit and finish. The company is raising $20,000 for custom runs of ApplePly and new tooling, and the desks are being made in Colorado. Maybe they should have named it the “klingon” – This one does look strong they have a video of like 3 or 4 people standing on it. I like standing at work, feel way more refreshed after an hour or so. 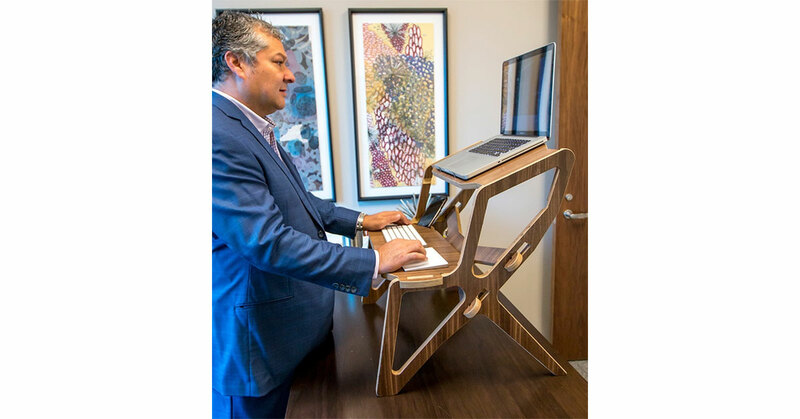 Weren’t standing desks’ advantages debunked not long ago? Still going strong over there? The side pieces vaguely remind me of a Bat’leth.